So I got this polish during the last VIB sale. At 20% off the price tag is still pretty hard to swallow, but the YSL polishes are GREAT. The brush on them is above average. Its firm enough but not too firm, wider than many but not too wide, and the application is impeccable. I can best describe the brush as being Dior-ish but not quite. I would have loved to pick up ALL of them, but at this point in time my store only carries three. And the other two did not in any way shape or from interest me. But I am digging this shade and thought I would share it with you. I highly recommend you picking this up. Its the PERFECT bright blue. 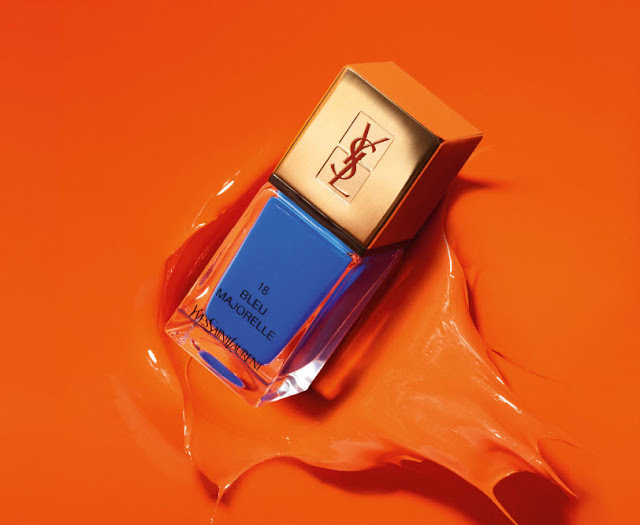 "There’s an interesting connection/history behind this particular blue shade, and the house of YSL; M. Saint Laurent who often visited Marrakech, Morocco for design inspiration, fell in love with a botanical garden there created by French artist Jacques Majorelle. Along with his partner Pierre Pergé, M. Saint Laurent then bought the garden 1980 and not only lovingly restored it all, but added a new design to it with each visit, preserved it as a museum of Islamic art, and eventually had his ashes scattered there when he passed away in 2008. The original garden was created in 1924 by French artist Jacques Majorelle, who drew inspiration from the blue colour found in local Moroccan tiles, and he used this colour throughout the garden, painting the walls, fountains, and features of the villa in this intensely blue shade, finally trademarking the name “Majorelle Blue”. And before ending this post, I found this promo pic from when the collection it was in first came out and loved it so much I just wanted to share it all with you.